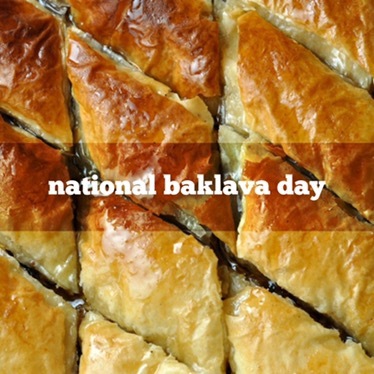 November 17th is National Baklava Day! Baklava is the ancestor of strudel. It was brought to Hungary by Turkish invaders in the 16th century. The dessert cake was created sometime before the 16th century. Baklava consists of 30 or more sheets of phyllo dough brushed with lots of butter, and layered with finely chopped pistachios, walnuts, and/or almonds. The origin of the name is still up for dispute: Turkish etymologists claim an old Turkish origin while others argue that the word “baklava” may come from a Mongolian root. 1749 Nicolas Appert was born. Appert was a French cook and inventor who developed the method of preserving food that we call canning. He originally used glass jars sealed with wax and reinforced with wire. 1988 Wal-Mart opened its first Super Center at Wheeler, Oklahoma. It carries fresh meat, produce, dairy products, and baked goods, in addition to other standard supermarket products and discount store merchandise. 1996 The World Food Summit concluded. Delegates promised full efforts to ease world hunger. I adore baclava – I must go to the shops and get some!! !